Ladies and gentlemen, may I introduce you to your local diner? You know, the one on the corner by the post office. Yeah, that one. 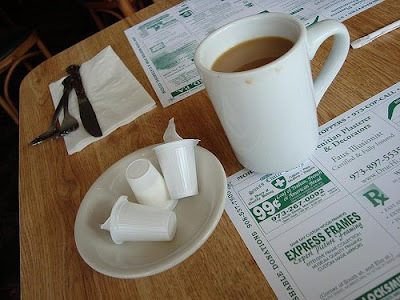 With the landscape being overrun by mediocre national chains, your local diner has become the oasis of good food that is relatively inexpensive. Now I'll confess, and tell you that we got caught up in the chain trend, and were neglecting our national culinary heritage. But we are making a major attempt to patronize as many local diners as possible. In fact, we will probably be at one tonight. And it's food you can trust, because it's the closest you'll ever get to home. Look at the variety: real meatloaf with mashed potatoes and gravy, homemade soups, Friday fish fry, tall stacks of pancakes, perfectly cooked bacon, turkey dinner any time, the only truly bottomless cup of coffee (in those heavy coffee cups that fit perfectly in your hand) and of course, you just gotta have pie. But don't stop with the standards... stretch out and give the slouvaki or glombki a try. And it's not just all about the food. The diner is the heart of any community. Folks go to meet, socialize, talk politics, complain about the weather, and plan the next Turnip Festival. It's where you go if you're upset and just need the comfort of a home-cooked meal. It's where the little league goes to celebrate the big championship (that is, if they still have that soda fountain). And it's the best place for that first date... go ahead get your slice of pie with two forks. "What can I getcha, hon?" And don't forget to tip generously.